Not sure what to bring as a dessert to the next get together? 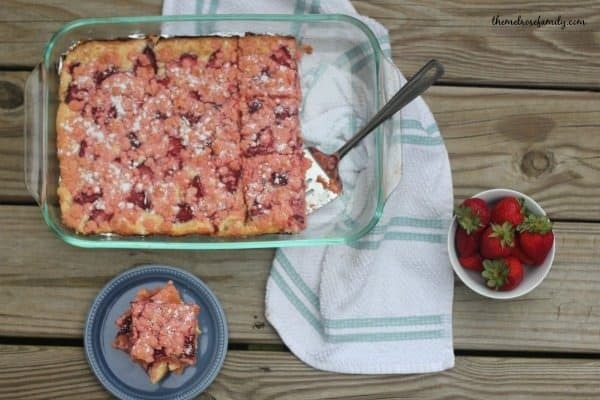 These Strawberry Pink Velvet Gooey Bars will have everyone asking for the recipe. 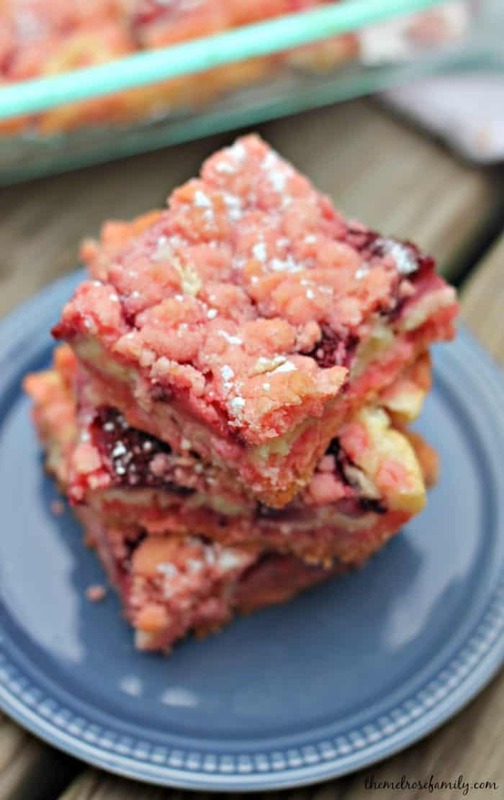 With a strawberry shortcake flavor and a gooey cookie like texture, you just can’t go wrong! As of June first my family and I have officially lived in NC for one year. In order to celebrate we invited friends and family over to our house for a Memorial Day barbecue. Joe was in charge of the grill with smoked brisket and I was in charge of the side dishes, desserts and beverages. I made my corn salad and potato salad as sides and whipped up a new sangria that is very similar to our Christmas Sangria, but with a bit more Summer flavors. The recipe is coming soon. I promise! For dessert though I outdid myself. I made gooey bars for the first time and even I couldn’t believe how good they were. My sister-in-law hit the nail on the head when she said they tasted just like Strawberry Shortcake Ice Cream Bars. Can you see the ooey gooey goodness? The strawberry layer was what put these over the edge. Just be sure that you don’t overcook these. If you check the bars and they’re still moving like jello in the center then they’re not done, but you’re close if you have a crisp on the edge. Since making these for the Memorial Day party, I made them again, but with red velvet cake mix rather than pink velvet cake mix and there was a distinct difference. I need to order my pink velvet cake mix in bulk apparently. 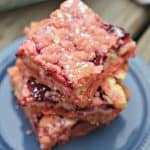 These gooey bars are no ordinary gooey bars with a strawberry pink velvet flavoring they taste just like strawberry shortcake ice cream bars. For the crust preheat the oven to 350 F and mix the pink velvet cake mix, butter and egg. Layer a 9 x 11 baking dish with tin foil and spray with cooking spray. Use about 2/3 of the crust mixture and push it onto the greased tin foil to create the crust layer. Meanwhile, in a large mixing bowl mix together the softened cream cheese, eggs and powdered sugar. Pour the cream cheese mixture or gooey layer onto the crust. Place the thinly sliced strawberries on top of the gooey layer so that strawberries are covering the entire area. With the remain crust layer crumble it on top of the gooey strawberry layer. Bake for about 45 minutes and let cool completely. Sprinkle with powdered sugar before serving.